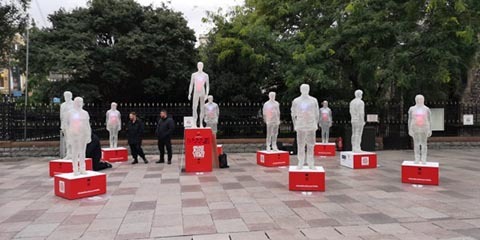 UK-based digital manufacturing service provider, Fluxaxis, has 3D printed two life-size master figures that were integral to a recent ‘Make Blood Cancer Visible’ campaign for pharmaceutical company, Janssen. The figures were used by Fluxaxis' customer Windsor Workshop to create molds for a series of ten life-size human bodies designed to convey the invisible nature of blood cancer. Fluxaxis produced the models on its Massivit 1800 3D Printer in less than eight hours each. This drastically reduced both the time and costs involved in creating the display compared to traditional production methods. Designed to give blood cancer well-deserved priority and recognition within the UK, real-life recordings of people with the disease were emitted from the human figures to enhance the sensory impact. The campaign travelled to key locations across London, Cardiff, Manchester and Edinburgh and received widespread pick-up across social media platforms. Watch the making-of video and its stunning execution here. The 10 life-size statues on display in Cardiff.